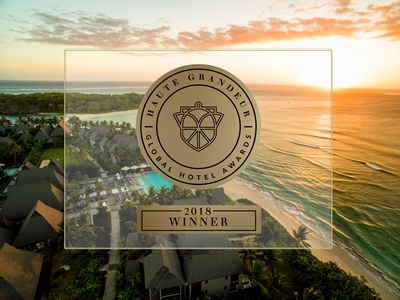 InterContinental Fiji Golf Resort & Spa is proud to be crowned as Fiji’s Best Beach Resort, Fiji’s Best Golf Resort, Fiji’s Best Resort Spa and Fiji’s Best Destination Wedding Retreat at the renowned 2018 Haute Grandeur Global Awards™ Gala Ceremony hosted on 1 November 2018 at Palazzo Versace Dubai. The Haute Grandeur Global AwardsTM celebrates the pinnacle of the best hospitality experience, recognizing the world’s most exceptional hotels, spas and restaurants and is synonymous with status, luxury and acclaim. “The Fiji Islands is a unique destination that celebrates stunning natural scenery both on land and underwater complemented by warm Fijian culture and a Pacific tropical climate to offer a destinational experience. From a young age, all Fijians are ingrained with hospitality that is gentle and overflowing, which makes us one of the best destinations for travellers – be it for couples or families,” says Andrew Davidson, Area General South Pacific at the InterContinental Fiji. “We are honoured to have been crowned with four luxury awards this year by Haute Grandeur. These awards are a fantastic achievement and recognition to the team’s efforts in delivering ‘Great Hotels Guests Love’ by going above and beyond to create memorable moments on our iconic location on one of the world’s best beaches – Natadola Bay,” concludes Andrew. Launched in 2014, Haute Grandeur Global Hotel Awards™ provides travellers with a trusted source of award-winning properties to choose from when booking their holidays or business trips and are now in their 4th year. Recipients of these awards are reputed to be the best in travel experiences in the travel industry. These awards celebrate the very best in hotel experiences across 7 continents, 172 countries and 90 unique categorise on a global, continent and country level. The Awards are decided with a unique process by gathering only quality guest feedback to continue raising the bar of excellence in service delivery and promising guests the best hotel experience. The 4th Gala Ceremony for the 2018 Haute Grandeur Global AwardsTM was hosted on 1 November 2018 at Palazzo Versace Dubai. InterContinental Fiji Golf Resort & Spa is part of the Intercontinental Hotel Group (IHG) with over 5,000 and 744,000 guest rooms in nearly 100 countries. Overlooking the azure waters of Natadola Beach – voted by CNN as one of the best beaches in the world, and Fiji’s finest beach, the resort is spread across 35 acres of tropical manicured gardens and offers all of the facilities and services expected of luxury international resort.